Number of cards in deck: 78 with frames, plus one blank. Measurements: 2.8 x 4.75 inches, or 70 x 120 mm. Back of card: Shown above. Booklet included: Yes, 24 pages, 2.7 x 4.5 inches, or 68 x 114 mm. Comments: Ever wanted to design your own set of tarot cards? Get this deck & have fun! Each card is labeled, major arcana with numbers top center, minor arcana with numbers in the upper left corner. On the bottom left, all cards show the planet ruling the card (lower left) and the Kabbalistic Tree of Life (lower right). Minor arcana cards have the symbol for the suit in the upper right corner (cup, dagger, wheel, wand). Additionally, major arcana also have the name of the card on the bottom. The brief instructions give useful hints on how to think about designing your own cards, including notes on planets, signs of the zodiac & the Sephiroth. The surface is suitable for felt-tip, ball-point pen, tempera, crayon, acrylic & oil. It is not suitable for pencil, charcoal, pen & ink, pastel or watercolor. 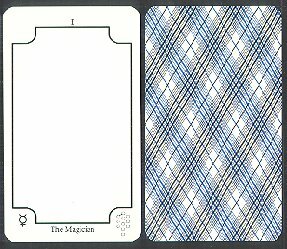 The crosshatch design on the back of the card turns up in most of the Rider-Waite decks, though not necessarily this color.